There is a bit of history involved with the origin of this unique blend of cuisines; I have given some details at the end of this post regarding the origins of this tantalizing fusion. If you are curious, go ahead and read it all. The ever popular Indian Chinese cuisine is the adaptation of Chinese seasoning/spices and cooking techniques to Indian tastes: tamarind combines with soy sauce, sugar with vinegar, Chinese spices are blended with cumin and coriander. Even the main ingredient in a dish is rarely of Chinese origin. The Indian cheese – Paneer takes over the meaty dishes. Soy sauce, garlic, ginger, sesame, Asian sesame oil, scallions and fresh coriander are used in plenty. Deep fried, stir fried, dry or with gravy, fiery, sweet and sour, hot and sour, you name it and you will find a dish to suit your taste.Chili Paneer, Chili Chicken, Chicken Lollipop, Manchurians, Sweet and Sour Prawns, Chow Mein are to name a few of the hundreds of dishes that could be called the “Stars” of the Indian Chinese cuisine. They are as popular as Pakoras, Chaat, Tikka and Butter Chicken. To categorize the dishes by region they would be the Manchurian dishes (Chicken Manchurian, Veg Manchurian, Gobi Manchurian), Schezuan or Sichuan origin (Schezuan Fried Rice or Noodles) and some of Hakka origin too. These are only a few to speak of. I grew up in and around the city of Kolkata/Calcutta – the city in India where the Chinese were known to first migrate. For me going out and eating “Chinese” (Indian Chinese in reality) was as common an event as going to buy a pair of shoes from the Chinese shoe store (The Chinese are know to make some pretty cool shoes in the city) or walking into a Chinese owned Salon to get a hair cut or even to get my tooth fixed to a Chinese dentist. Quite a bizarre series of food, shoe, hair and tooth, right? The Chinese had come and became a very prominent part of the economy and culture. I did have friends who owned some shoe stores, but unfortunately none that owned restaurants. But the good Chinese restaurants are plenty around the city. The Indian Chinese food is so well accepted and admired that even the Indian street vendor will fork up some Hakka Noodles on to your plate from a big pile of the make shift griddle, and have you come back for more. 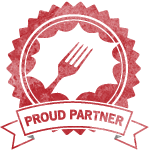 The unforgettable taste of the hot, smoky, steamy food and a fusion of flavors from back home lingers strong in our memory. They are incredibly tasty, a gluttonous winning combination of both the worlds. Being a favorite kind of cuisine in our home, we cook and appreciate a lot of Indian Chinese and I will be posting the recipes over time. 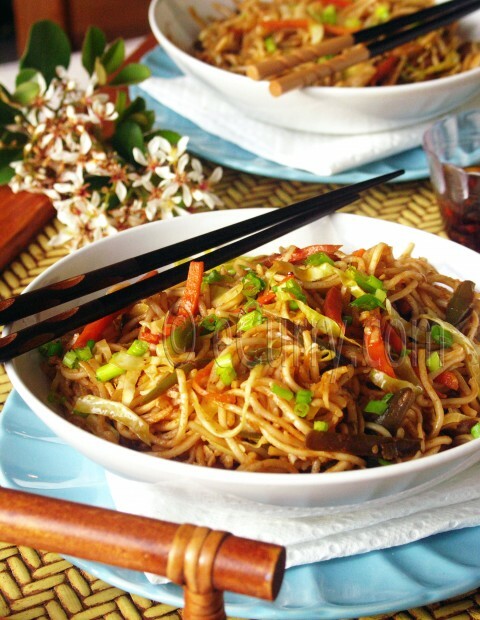 For now it is the Hakka Noodles: a simple stir fried noodles with a whole lot of flavors. Updated: This recipe does use a sauce but the end result is a completely dry dish. There will not be any sauce left over in the noodles after it is cooked. So make sure cook the sauce at high heat and reduce it to almost fried before you add the veggies and the noodles. 400 grams Hakka Noodles (I used Ching’s wheat 100% vegetarian noodles ) – The egg noodles work as well. Note: The soy sauce that I usually use is the kind we get from Kolkata/Calcutta ;(yes I stock up when I visit:-D ); this dark soy sauce is thicker and darker and has a slightly different flavor than the usual kind we get here. The kind I use is NOT available in the Indian Groceries here. I have tried the Chings Secret soy sauce from the Indian groceries and was not too happy about it. If you are trying to make this, just use the regular dark soy sauce available in the groceries stores here, like the Kikkoman or La Choy brand. If you feel you might need more than I have mentioned here, go ahead and use it. Note: feel free to incorporate eggs, seafood, meat or tofu to this dish. Make sure to cook these first before combining them in the stir fry. Combine all ingredients of the “Sauce” in a food processor till it is almost like paste; if it gets too dry, add a few teaspoons of water, but do not make it too runny. Keep aside. Heat about 20 cups of water (or enough for the noodles to be submerged under water). Bring it to a boil, add some salt and a splash of oil and cook for not more than 3 minutes. The noodles should be al dente; drain quickly and spread the noodles on a flat surface and splash some more oil to prevent them from sticking to each other. Heat the sesame oil in a large wok. Add the chili flakes. and after half a minute add the sliced onions. Cook at high heat till the onions are just about clear. a Immediately add the processed ingredients for the “sauce” and the salt. Cook at high heat for about 3-5 minutes or till the raw taste of the garlic disappears. Lower the heat; add the vinegar and the soy sauce. Stir everything together till well combined. Increase the heat to high, add the bell pepper, carrots, and beans and cook for only a couple of minutes. The vegetables should retain their color and crunch. Switch off the heat. Add the noodles to the wok and stir them in carefully till all the cooked ingredients in the pan and the noodles are very well combined. Add the shredded cabbage. Switch on the heat and cook the noodles on very high heat while flipping them every frequently, so the sauce, veggies and the noodles are combined uniformly while making sure the noodles do not stick at the bottom of the wok; cook for about 3-4 minutes. Switch off the heat. Combine the chopped green onions and serve immediately with some Hot Oil. While the Chinese have been visiting India for millennia in search of Buddhist teachings, Yang Tai Chow was the first recorded Chinese to migrate to India for better material prospects. In 1778 he put down roots in Kolkata, or Calcutta, the then capital of British India and the easiest accessible metropolitan area from China by land. Over the years, many like him came, mostly Hakkas, and by the early part of the 20th century a Chinatown had developed in Kolkata and it thrived and buzzed with enterprise. Chinese served with distinction as dentists, tannery owners, sauce manufacturers, beauticians and shoe shop owners but it was as restaurateurs that the Chinese found their fame and glory in India. .. The Indian form of “Hakka Cuisine” originates from the fact that the a lot of Chinese restaurants in India are owned by the people of the Hakka origin. Both the Indian and the Chinese cultures combined, accepted and fused happily in terms of food giving birth to an entirely new kind called the Indo-Chinese or the Indian Chinese; with the taste and flavors very different from both Indian and Chinese cuisine, it is a genre by itself. 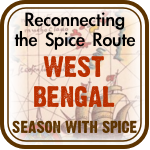 It is bold, varied, spicy – overall an experience by itself. The Indian Chinese flavors are also enjoyed by Indian and Chinese communities in Malaysia, and Singapore. Read More about the Indo-Chinese Cuisine here. Its breakfast time and now I feel like having hakka noodles 🙂 Looks very mouth watering! This dish looks fantastic. What a lovely arrar of colors! The noodles look so awesome. I can devour the whole bowl :). Also, wish you and your family a very happy Bengali New Year. Hakka noodles are my fav…ur pictures are very tempting. Love the sauce recipe..shall try this next time I make noodles. Ann, that dark sauce is the dark soy sauce. I had missed the “soy” and have corrected it. Sorry about that. love indo chinese and is a regular in my kitchen. like the idea of sauce which I just learnt from a favourite vegetarian chinese restaurant of mine but they add some chilli sauce to it and lessen the amount of garlic. lovely picture as usual. Sayantani, I do have the chili sauce in the list. 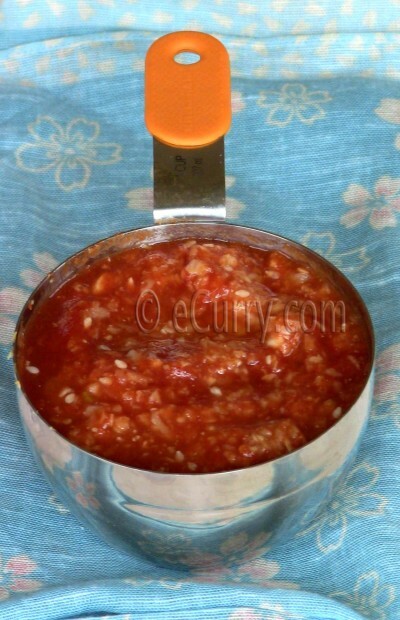 That is what I meant by hot sauce:-) I have updated the post. This is one of our fav dishes…but the sauce is new to me….thanks for sharing the wonderful dish…the info is also a nice read…..and the snaps are awesome…. Very interesting to see the fusion of Indian and Chinese cuisine in India! I have seen how these two fine cuisines are combined in Malaysian and Singaporean cooking from my MIL. The noodles look soo good! A mouthwatering dish! I really love noodles! Wow this is all so mouth-watering!! Yum Love the noodles and the post.Very informative the post is. Oh my that platter of noodles looks so tempting! It is interesting that your recipes does not call for soy sauce; I use lots of soy sauce in my noodles. I must try this soon. Nupur, I did use soy sauce in the recipe. But I did not cook it with the sauce. Added it after the garlic was cooked. Well loved dishes all of them, probably the first exotic cuisine we tasted as kids and fell in love with. I love the noodles you have here. Would make a great lunch for the noodle loving kiddos if I have the sauce ready ahead of time. Totally agree one grew up eating this, well from my teens onwards. Last time I had this ws in India, this looks so so delcious, i just wish i had a whole plate of it. Very good and so informative. Yet another noodle out there to try. These noodles sound amazing! I love the sauce! Sounds very interesting! Looking forward to future Indo-Chinese dishes! Mmm, this is my kind of dish. I love the the flavors, the sauce–a deliciious hearty one bowl meal! Those flowers are growing all around our house in the hedges for a while now 🙂 I don’t make extra food for pictures ..LOL But I do click right after I am done cooking. The family has got used to the deal now! I was not happy with these pictures as towards sun down there is not enough light for my camera and the not so good yellow sunlight comes beaming through the window on the food. I do not get much time to edit photographs… so I try to take pictures when there is good natural light, which obviously did not happen this time. I love the sauce u ve made! My son is huge fan of noodle and of course me too, i got to give a try with this sauce! Hakka noodles is a new one for me but so so intriguing! Your shot of it is great by the way, makes me want to sample some this second! This is a very beautiful and colourful dish and surely sounds very delicious and tempting to try. That sauce sounds fantastic, Soma! Love, love the pictures…..what a delicious looking dish as usual! Great pix as usual, Soma, what are those pretty flowers called? arey arey…eto samrat resturant r noodles !!! mone porey naki? I love hakka noodles! I’m drooling here! I love Chinese food and love Indian food, so can I say I love Indo-Chinese food? Maybe I have unknowingly been cooking Indo-Chinese food at home but don’t know about it. 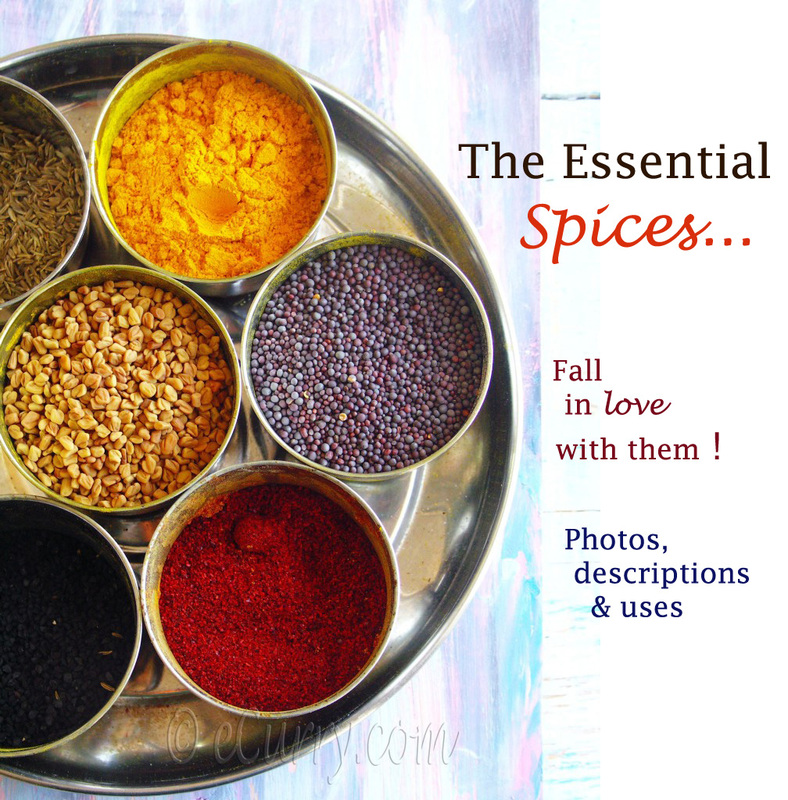 I enjoy using Chinese ingredients and Indian spices to create my dishes – does it make sense? I always loved this! Never tried at home,thanks for the recipe! I love noodles and could live on it 365 days a year 🙂 Good to know about some Hakka history. Growing up in India, we were begining to hear about Hakka noodles in late 80’s but did not know about it’s history. Looks good. This looks like great comfort food. 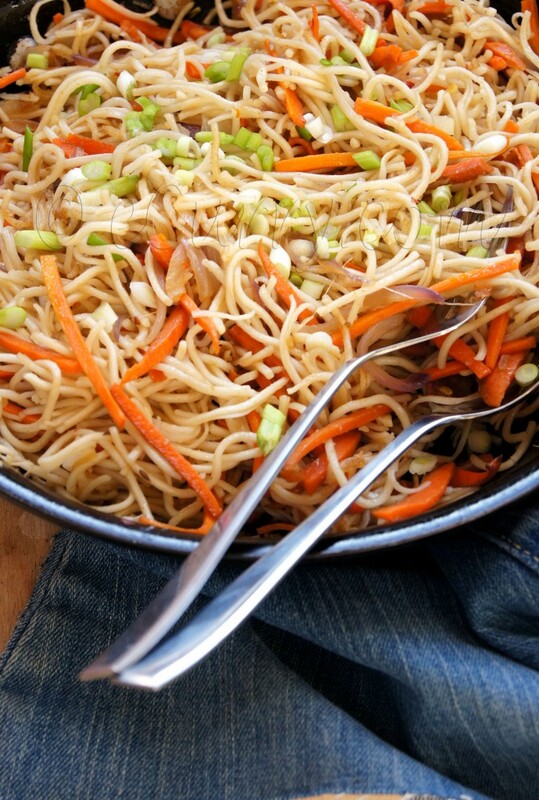 This mix of vegetables, noodles, and sauce is something I could enjoy very regularly! Another favourite from our Indian Chinese cuisine. This is something we all love. The flavors here are absolutely wonderful. And your presentation is beautiful. Love the fusion of these two cuisines! It was a lovely recipe. The best part of your cooking style (which u share with mine too) is to cook with things available in the house.I dont have to run to the grocery store to try a recipe from your blog. Please share recipe of “chilly chicken & american choupsey” if possible…the indo chinese style. Lovely post and story, Soma! I just made this for dinner. And this is my first time making good hakka noodles. The above looks very delicious… can you please let me know where do we get Asian Sesame oil? I have Idhiam oil( which is also seasame and used in most South Indian cooking).. and was not quite sure whether this will work for an Indo Chinese cusine..
Asian Sesame Oil is available in all super markets, in the Asian section, where they stack noodles, chinese/thai sauces, soy sauce etc. thanks for the excellent description of how to make such a simple dish – yet it needs correct timing…. Am going today to buy the hot sauce. I dont have the “magic soya sauce” 🙂 … but still …. 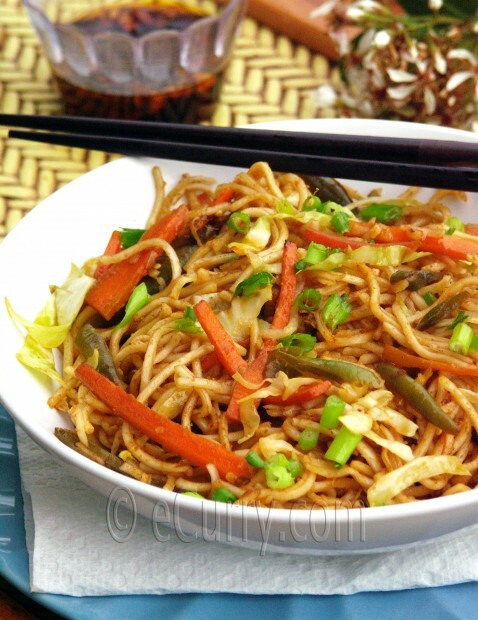 This sounds like an excellent recipe for hakka noodles! My husband and I both adore Indo-Chinese cuisine, so I’ll definitely have to make this soon! I actually added Indian cloves (lavang) and yes that sauce kind of tasted weird 🙂 Thankfully I noticed you mention garlic later on during the cooking process. I am so very sorry! Yes it should have been the garlic. And thanks a lot for pointing that out. I have corrected it. 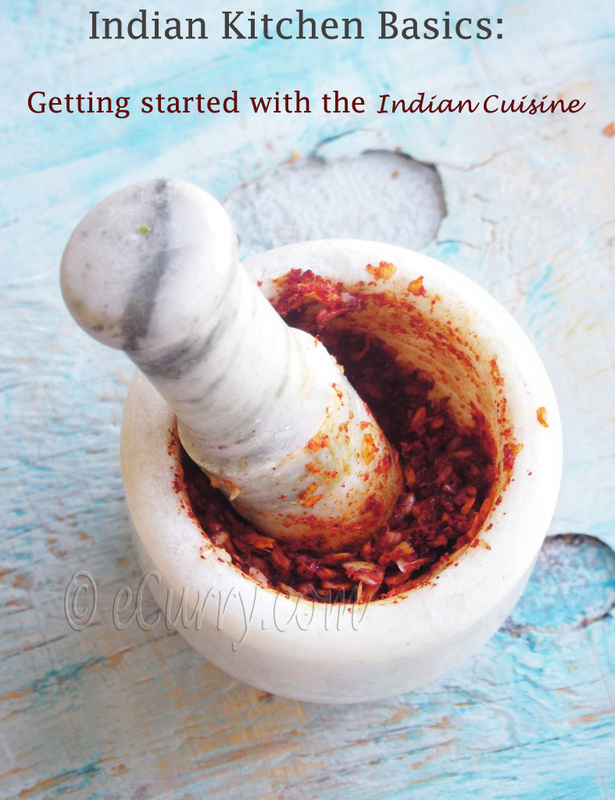 Nice post … Love the part on the origin of indo Chinese cuisine which is such a integral part of our food habits in India.. Ofcourse I crazily(if that’s even a word!) miss Indian Chinese in the states .. N home made flavors never come to the same ..:( .. Yet gonna try ur recipe .. Ahhh the cravings for Indian Chinese … Can’t stand the quality of Chinese here …. Interesting how you have explained how the indo-chinese food came about. I’m going to try this recipe out with paneer. Wonderful looking resume. I live in India. Can u name the brand of Soy Sauce u use? I can buy it here. I am also from Kolkata. And miss eating chowmein from road side stalls 🙁 ( Home sick!) May, I ask do you use a specific brand of soya sauce? Or do you get the nameless, brandless (Chinese) big narrow bottles of sauce they use for egg rolls and noodles? I have a stock of soy sauce from Kolkata which I mostly use at home. But if you are outside India/Kolkata use any thick/dark soy sauce. Kikkoman as they sell in US is a popular brand, but I have found those little pouches that the Chinese restaurants hand our work too 🙂 tho’ not as well as the ones from Kolkata… none of these here have the same flavor and taste. Hope this helps. I feel silly saying this to a photo pro like yourself…but do you ever use the “Exposure Compensation” function on your camera to lighten the scene when it’s too dark? It has saved many pictures for me. First I am not at all a photo pro! 😛 I am still very new to my dSLR and learning my ways around and I do not even shoot in a manual mode. But yes I do use the exposure compensation feature in the camera. Are you talking about any particular photograph? These hakka noodles were shot way back when I had about started blogging and they are awful. But there are times when I shoot in dark tones just becoz I love the low tone mood in that series. No particular photos, no! I don’t remember where I read it, and now I can’t find it, but I THOUGHT you made a comment about a dark picture. So I wanted to mention my most helpful camera function, after Macro! Your pictures are exquisite and such an inspiration…you are making such a lovely contribution. I stumbled upon your website whilst looking for pineapple dessert recipe. Looking through your recipes sure brought a lot of memories back when I was in Calcutta. Needless to say I’ll be dipping in and out of your blog looking for more recipes ideas. Lovely blog and especially your food images. Wow! 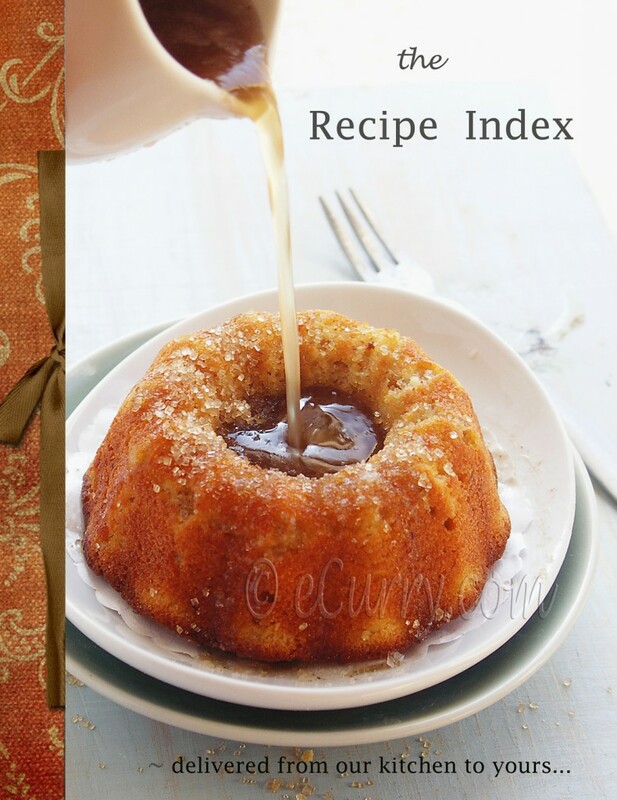 It is such an interesting guide to cooking good food.This recipe looks easy and one I will add to my list!